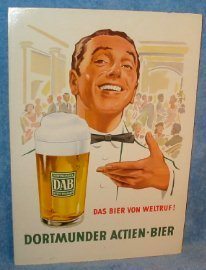 Dortmunder Actien-Bier; 11 3/4 x 16 1/2 inch, laminated cardboard sign. Has an easel stand on the back. From the looks of the advertising this “appears” to be fairly old and possibly brought over here from Germany. Great sign in real nice shape.